I really have not kept up on what CORE does these days, but now I am utterly disinclined to try. For Martin Luther King Day 2006, CORE is honoring Mississippi Governor Haley Barbour—panderer to white supremacists who wears the confederate flag on his lapel with pride. “We have invited Gov. 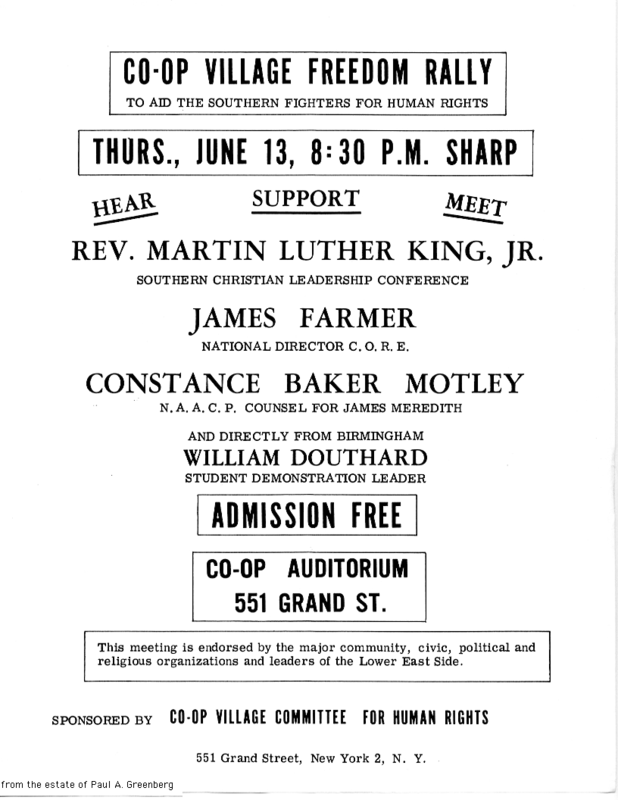 Barbour as a representative of all of the great people of Mississippi in recognition of the state’s progress in race relations after the successful prosecution of the 1964 murders of CORE volunteers Andrew Goodman, James Chaney, and Michael Schwerner,” said CORE national spokesman Niger Innis. In observance of the King federal holiday, CORE hosts an annual Ambassadorial Reception and Awards Dinner in New York City. This event has grown to become one of the largest events in the country honoring Dr. King with more than 2,000 people from all walks of life attending each year. This year’s 21st annual black tie event will be held at the New York Sheraton Hotel and Towers at 7:30 p.m. on Jan. 16, 2006. If you're relatively new to HungryBlues, you may not know that I have a somewhat different view of the significance of the Edgar Ray Killen trial. The article is from the Jim Prince edited Neshoba Democrat, so not only do we get the drivel, above, we get a whole lot more about Barbour's "historic" role in supporting the "call to justice" of the Philadelphia Coalition, which Prince co-chairs. The indictment of the ex-Ku Klux Klan leader in January followed a community-wide call for justice which the governor and other elected officials embraced here in June 2004 at an event commemorating the 40th anniversary of the slayings. Gov. Barbour was in Philadelphia and joined in the call for justice at the event which drew about 1,800. “We know that when evil is done it is a complicit sin to ignore it, to pretend it didn’t happen even if it happened 40 years ago. You have to face up to your problems before you can solve them,” Barbour said at the time. One year later, on June 21, 2005, a Neshoba County jury found Edgar Ray Killen guilty of three counts of manslaughter in connection with the murders. Let's just say that neither Barbour's appearance at nor the Philadelphia Coalition's role in the memorial were universally appreciated. Past honorees have included Laura Bush and Rudolph Giuliani. How many people remember that Giuliani's 1993 mayoral campaign ran a full-blown, racist voter suppression operation to get him elected? I guess Barbour will be in good company. I'll be even a little more blunt. Haley Barbour refuses to disavow his affiliations with the neo-confederate movement and its powerful Mississippi mouthpiece, the Council of Conservative Citizens—the same organization that under a different name (White Citizens Council) fostered the environment in which a gang of klansmen, including law enforcement, could beat and shoot to death James Chaney, Michael Schwerner, and Andrew Goodman—and so many others—with total impunity. A few nice sounding words on the podium of a farcical memorial don't change anything. As Katrina Survivor Leah Hodges said before the Select Bipartisan Committee to Investigate the Preparation for and Response to Hurricane Katrina, "If I put a dress on a pig, a pig is still a pig." Peter Wagner has a fascinating new piece on Prisoners of the Census. If you're new to what Peter does, his organization, the Prison Policy Initiative, does innovative research and advocacy on the problems that ensue from counting mostly urban Black and Latino prisoners as residents of the predominantly white rural communities where many are imprisoned. Miscounting prisoners in this way diminishes the political clout of the communities the prisoners come from and provides the host communities with a windfall of tax revenues, based on the "increase" in their populations. The surprising thing is that communities who lose money to this arrangement are not the urban ones where the prisoners come from, but the the other adjacent rural areas that don't host prisons. [M]ost of the money redirected by prison census counts is raised in specialty taxes (liquor taxes, cigarette taxes, recreational park usage fees, hunting-fishing licenses, etc.) and county sales taxes. Not all states have these revenue sources, and in the big picture this is small change, but it is important to see who pays for the windfall received by some. Dutchess County, NY, can provide a detailed example. In 2003, the town of Fishkill and the small City of Beacon argued over whether the prison counted in one town was really in the other because $85,000 in county sales tax revenues was at stake. Although the prisoners were from New York City, neither the prisoners nor New York City had a valid claim on these funds. This was not a state sales tax being distributed within the state on the basis of population, but a county sales tax being distributed on the basis of population within the county. The county sets the tax rate — about 3% of each purchase — and keeps that money locally. As a result of their "population" based formula, towns with elevated populations due to prisoners get an extra share. So if that money doesn't belong to New York City or to the prison towns, to whom does it belong? That money belongs to every other town in the county that does not have a prison. The towns with prisons get a windfall, and every community without a prison is deprived of about 1.7% of the tax receipts it would otherwise receive. Today, the full U.S. Court of Appeals for the Second Circuit is hearing arguments in two cases alleging that New York's felon disenfranchisement laws violate the Voting Rights Act and the U.S. Constitution (Muntaqim v. Coombe and Hayden v. Pataki). The National Voting Rights Institute and the Prison Policy Initiative have filed an amicus brief with the Court arguing that the Court should consider the redistricting implications of disenfranchisement as part of the "totality of circumstances" which must be examined under the Voting Rights Act. The brief highlights the New York State legislature's racially discriminatory redistricting practice of crediting rural white counties with additional population based on the presence of disenfranchised prisoners in upstate prisons. New York State is majority White (62%), but its prison population is majority Black and Latino (82%), so disenfranchising prisoners and parolees results in a disproportionate bar to Black and Latino political participation. In their brief, the National Voting Rights Institute and the Prison Policy Initiative provide new information to the court showing how New York State's disenfranchisement practices combine with its redistricting practices to diminish the voting strength of non-incarcerated persons of color in the prisoners' home communities. In drawing state legislative districts, New York uses Census Bureau data that counts the state's mostly urban and minority prisoners as residents of the mostly white and rural prison counties rather than as residents of the home communities where they resided prior to incarceration, where they are deemed legal residents for most other legal purposes. Several upstate legislative districts lack sufficient population to meet accepted one-person, one-vote standards without counting disenfranchised prisoners as part of their population base. At the same time, heavily minority districts in New York City would in all likelihood be entitled to additional representation if prisoners were counted as residents of their home communities for purposes of redistricting. The brief argues that New York's practice has an historical parallel that the Court should be disinclined to follow. "The practice bears a striking resemblance to the original 'Three-Fifths' clause of the United States Constitution, which allowed the South to obtain enhanced representation in Congress by counting disenfranchised slaves as three-fifths of a person for purposes of congressional apportionment," says Prison Policy Initiative Assistant Director Peter Wagner. Brenda Wright, managing attorney of the National Voting Rights Institute and the author of the brief, says: "New York's decision to credit disenfranchised prisoners to largely white counties, rather than their home communities, is a critical example of racial discrimination the court should consider." In the two cases, the Second Circuit has taken the unusual step of granting in banc review by all active judges on the Court. The lower courts initially ruled against the plaintiffs and held that Section 2 of the Voting Rights Act does not permit a challenge to prisoner disenfranchisement. The amicus brief of NVRI and the Prison Policy Institute, filed on January 28, 2005, is available on NVRI's website at: http://www.nvri.org/about/new_york_state_policies.shtml and in hypertext on the PPI site at http://www.prisonpolicy.org/reports/muntaqim.shtml. The National Voting Rights Institute is a nonprofit, nonpartisan legal center. Through litigation and public education, NVRI seeks to make real the promise of American democracy that meaningful political participation and power should be accessible to all regardless of economic or social status. The Prison Policy Initiative conducts research and advocacy on incarceration policy. Among its publications are a report, Importing Constituents: Prisoners and Political Clout in New York , which documents how the transfer of a large, non-voting population to upstate prisons, where it is counted as part of the population base for redistricting, artificially enhances the representation afforded to predominantly white, upstate legislative districts. Two Fridays ago (4/8), my mother called to tell me she had just talked with a retired journalist, named Jeff Prugh. Apparently Jeff had come across my posts on the Roosevelt Tatum story, and he wanted to talk with me. Between my father's name and the mentions of Delmar, NY in the Tatum series (I called it "From Delmar to Bombingham"), Jeff figured out how to reach my mother. Jeff called because he had researched this same story, starting three decades ago, interviewing many of the principle figures who were involved, including the likes of Macon Weaver, the US Attorney who drummed up the case against Tatum in the first place. If you haven't followed the links, or read the posts before, Roosevelt Tatum claimed to have witnessed two Birmingham Police officers planting the bombs that destroyed AD and Naomi King's home on the night of May 11, 1963. The Kings and their five children were in the house when the bombs went off and escaped alive only by good luck. After Tatum made his allegations and made several official statements to this effect, he abruptly retracted his testimony and was then prosecuted for false testimony. Tatum was convicted swiftly and sentenced to a year and a day in prison. Both Jeff and I—as well as Diane McWhorter—have concluded that Tatum was bullied out of his original testimony through a rigged polygraph test, administered by the FBI in Birmingham. Jeff was astonished to find my work in part because until he read this post, he'd made the same mistake that Macon Weaver had in assuming that the Greenberg mentioned in FBI documents was the famous Civil Rights Movement attorney, Jack Greenberg. When my mother called two Fridays ago, I was lying in bed, trying to recover from a bad cold in time for a job interview on Monday the 11th. I was still under the weather all weekend, and I wanted to use my spare time to prepare for the interview, so I didn't end up calling Jeff back until Tuesday night (4/12). It was exciting to compare notes with Jeff because we'd reached so many of the same conclusions from our separate research and because we had each learned things that the other hadn't. While Jeff had spoken to many of the people involved—a number of whom are now dead—I had succeeded in getting additional FBI documents on the case declassified. His research led him more deeply into corruption in Alabama regarding Tatum's case; mine had revealed new details about what happened while Tatum was in Washington, DC with my father and AD King (the next part in the Delmar to Bombingham series, still in the works). In June  while Rooselvelt Tatum is being questioned in Washington, Moore becomes incensed when [sic] learns that his boss, U.S. Marshal Peyton Norville, and Judge Allgood participate in selecting the federal grand jury that would indict Tatum. In sworn testimony, Moore would say that he told a Washington-based official of the U.S. Marshals Service that his boss had bragged to him about putting his son-in-law on the grand jury. A Justice Department examiner's report in 1964 would say that "...the jury box was one name short. The then Marshal, Mr. Norville, knowing his son-in-law to be a qualified voter, wrote his name on a piece of paper and put into the box. When the Marshal returned to his office he passed this information to the Chief [Moore] in an informal conversation . . . ."
In 1964, Moore would be subpoenaed by an attorney who represented eight white supremacists and who had been tipped about Moore's allegations that U.S. Marshal Norville had told him he had placed his son-in-law on the grand jury. The eight members of the militant National States Rights Party had been indicted by the Tatum grand jury for disrupting efforts to desegregate some of Birmingham's schools. After the attorney takes Moore's deposition alleging that the grand jury had been improperly impaneled, Moore is called to Judge Allgood's chambers, and, according to Moore, the judge tells him: "You've got me backed against the wall now. What the hell am I supposed to do? Moore to Judge Allgood: "Throw 'em all out! Dismiss all the indictments [including Tatum's]! Amid allegations that the grand jury was tainted, the judge drops charges against the whites—publicly citing "fundamental deficiencies" in the indictment—but the judge doesn't let Moore's testimony impugning the grand jury get in the way of the case the feds had built against Roosevelt Tatum. Dan Moore continues to press for propriety in the federal courthouse in Birmingham. However, he becomes persona non grata. He refuses an offer of a lifetime pension of $3,971 a year ($331 monthly) if he would retire on the spot, after nearly 20 years with the U.S. Marshals Service, and claim what he says would be a bogus disability. He would describe the offer as "a crooked scheme designed to steal public money and to cover up what I knew about obstruction of justice in the Tatum grand jury." I called Bob immediately, of course, and we had a great, wide ranging conversation—Birmingham, Ray Charles, Nina Simone, Liberal Party, CORE, James Farmer, the Lower East Side . . .
Bob had been in charge of security for the concert and had taken pictures. Bob was emphatic that I should have the negatives. "If anyone should have them, you should. They belong to you . . ."
Until last week, that was the last I'd heard from Bob. But then there he was on my voicemail, saying he'd been in the hospital again but he is doing better now and he needs my address so he can send my the pictures. I called Bob as soon as I got home from class. I couldn't catch everything he told me about the negatives because my son Aaron (who is now two, by the way) was resisting bed time, and exuberantly showing off his command of two word phrases and multi-syllabic words as he climbed into his high chair to join me and Ruth in our ritual, post-yoga class take out. Last Friday (4/15), I received some interesting mail: 1 oversized, padded envelope, from Jeff Prugh; 1 9 x 12 manilla envelop, from Bob Adamenko; 1 flat, cardboard mailer, 6 x 8 1/2, from Jonathan David Jackson. Jeff sent me a copy of Alveda King's book and a photocopy of the Marin Independent Journal article (not archived on the paper's website). Bob sent me several contact sheets from the Birmingham negatives, a contact sheet of negatives of scenes from Washington, DC in 1963, the day before the March on Washington, two large prints, and a letter of recommendation that my dad wrote for him in 1976, while Dad was Secretary to the New York State Tax Commission. Jonathan sent me his new chapbook of poems (also see this post). I spoke with Bob on Saturday, to tell him his envelope arrived. He told me he's sending the negatives next. 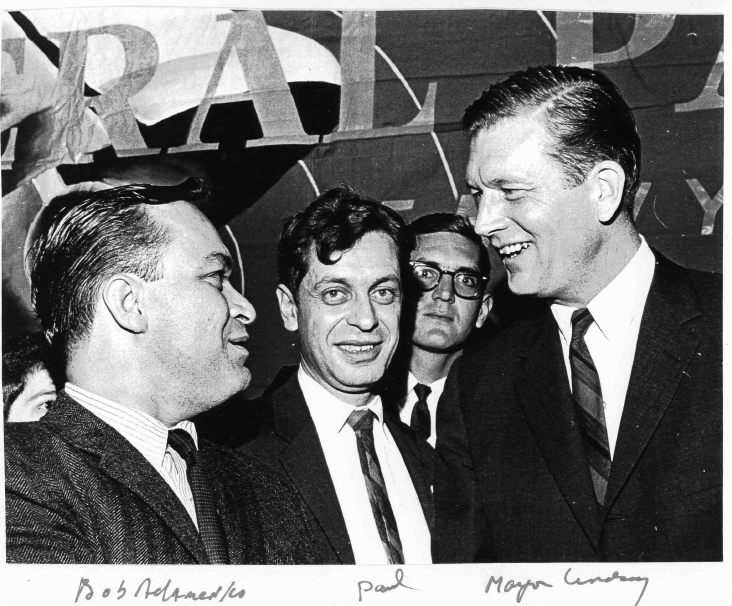 One of the prints from Bob was a press photo (at right) from John Lindsay's first appearance after he won the New York City Mayor's race in 1965. Lindsay was a Liberal Republican, with a capital "L" and a capital "R." That is, he ran in 1965 on a joint Liberal/GOP ticket. In 1965, my father was Assistant to Executive Director and Legislative Representative for the Liberal Party of New York, and he was one of the driving forces behind Lindsay's mayoral campaign. In this victory photo, you can see the Liberal Party banner overhead. In front, from left to right, it's Robert Adamenko, Paul Greenberg, and John Lindsay. I'm not at all certain, but I think that might be my mother, very partially visible behind Bob's left shoulder, standing next to Dad. Update 7/9/05: Jonathan David Jackson's website is down; links to it removed for now. JACKSON, Miss. (AP) _ When he was Senate minority leader, Mississippi Republican Trent Lott helped support New York City as it recovered from the terrorist attacks of Sept. 11, 2001, former Mayor Rudolph Giuliani said. On Tuesday, Giuliani was in Mississippi to give Lott some political help, speaking at a luncheon that raised $200,000 for Lott's campaign fund. "I'm here because he's a great leader for Americans," Giuliani said as he stood with the senator during a news conference.